In all honesty, I was fully prepared to be underwhelmed by this story. It seemed a little too good to be true, with an amazing sounding plot and good reviews. Sometimes I get a little cynical and don’t trust what I see. For The False Prince, I think this was a good thing. It let me be wowed and amazing with how quickly I fell in love with Sage and the story. Sage is an orphan when he is bought and dropped into the middle of a plot to place an impostor prince on the throne. Four years after the death of Prince Jaron, Connor selects four boys he plans on training to be the prince, then selecting one to be the prince. Sage wants nothing to do with this, preferring his life on the streets to being a pawn in someone else’s game. There is a touch of romance in this story, however it’s more of a promise of more. The main focus on this story is setting Sage up for the future events and demonstrating how quick and clever he his after his life on the streets and in orphanages. That said I’m very interested in seeing how things play out in Sage’s love life after reading just the little pieces in this novel. I don’t think I realized how much I was enjoying this book until it seemingly hit me in the face. I was going along, having a nice time reading when it suddenly dawned on me just how much I was loving it. I didn’t want to read another word because that was one word closer to the end. Of course, by that time I couldn’t stop reading. I’m pretty sure I had a semi-permanent cheesy grin on my face for the last fourth of the novel. I will say I guessed the surprise, but even so, it was wonderful to see how things actually played out. It is obvious Nielsen spent time fleshing this story out and making sure each little detail fell perfectly into place. I liked that she didn’t describe each little thing Sage did, because when Sage whipped out a coin he had stolen or revealed the other mischief he had been up to I was entertained, happy, and wowed. 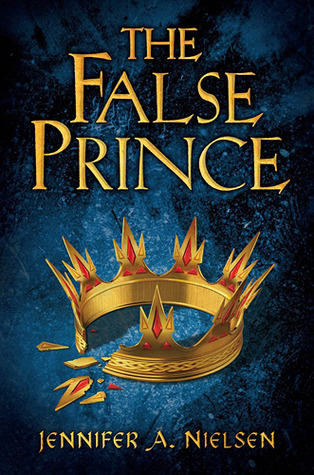 The False Prince lived up to every expectation I had going in and continuously surpassed any ideas I had about the novel. It has drama and family and a bit of romance. Every little piece of the story was wonderful and I can’t think of anything I’d want different. I can’t wait to get through what’s left of my to-be-read pile and read what comes next. This entry was posted in Mystery, Thriller, and Suspence, The Must Reads, Young (and New) Adult and tagged Jennifer A. Nielsen, Must-Reads, Mystery/Thriller, Young Adult.